After losing her sister to gastric cancer, Weintraub begins looking for answers on cancer research. Her search leads her to the relatively new field of comparative oncology. In this field, dogs with cancer help find cures for other dogs and people. I'll admit, when I first requested this book, I thought it was going to focus on helper dogs that can smell when their human has cancer. I had no idea that the focus of the book would actually be cancer treatments and drug development. Apparently the molecules that form DNA in dogs are a closer match to those in rats. Combine this with the fact that dogs naturally get cancers similar to humans, while lab rats have to be engineered to get cancer, dogs are clearly better test subjects for medicines for humans. Another boost is that, because there are so many detailed records of dog reactions to traditional medicines alone, no dogs have to get a placebo. This leads to one of the most interesting parts of this book, for me, the difference between how veterinarians treat their animal subjects versus how doctors treat their human patients. For the veterinarians and veterinary students who helped with the studies, the dogs' quality of life was of the highest priorities. Meanwhile, Weintraub's sister receives several surgeries and medicine that almost eliminate her quality of life and is even called "an experiment" by her surgeon. Weintraub's biggest challenge in this book is finding the right balance between the heavy science and the heavy emotions of Comparative Oncology. Ultimately, I feel she succeeds in this. There is enough real science for the reader to educate themselves, but not so much that they get bored. There is enough emotion to keep the reader engaged and empathetic, but not so much that the book is just too sad. If anything, the reader is left with a feeling of hope for the future of oncology treatments. 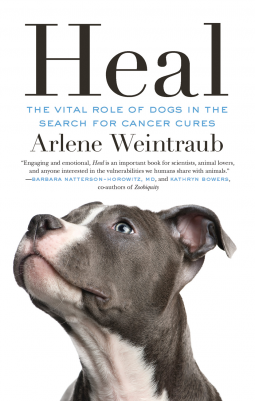 So if you have an interest in oncology, have been affected by cancer, or just want to know more about how dogs are truly man's best friend, I recommend picking up a copy of "Heal" by Amy Weintraub.